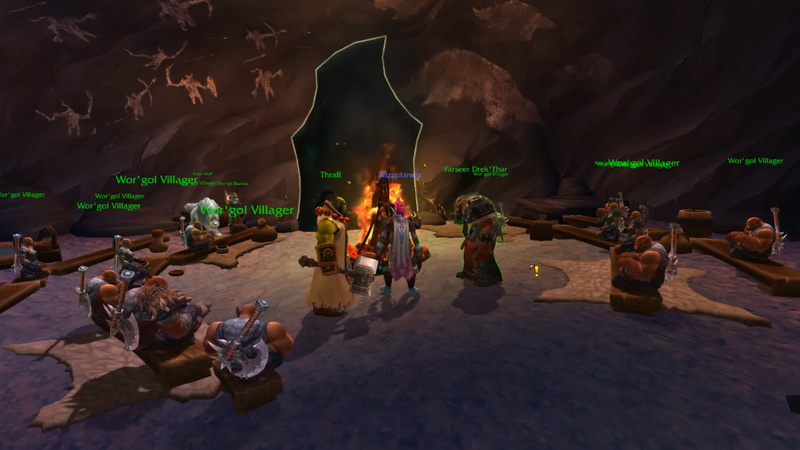 Farseer Drek’Thar: You have honored my people. Now, we wish to honor you. We have a rite of initiation in my clan. When one comes of age, they cover themselves in the blood of their first hunt, and rest their hands upon a shamanstone to honor the ancestors who came before them. In our brief time together you have already slain many foes more fierce than our hunters have ever had to face. Go, touch the shamanstone here in Wor’gol, and join our pack as an equal. Go to the Shamanstone in Wor’gol and receive a blessing. Farseer Drek’Thar: Come, friends. If you wish to fight with our clan, we welcome you to receive our blessings. Reach out to the Shamanstone. Embrace the wisdom of this land and the ancestors that came before us. Thrall: I can feel it. This land speaks to me, but in a language I do not yet understand. Farseer Drek’Thar: I am still scarred by those infernal warlocks. The spirits are quiet. Thrall: The spirits will never abandon you, Drek’Thar. This I promise. Shamanstone: Spirit of the Wolf (buff): Run speed increased by 30% while out of combat. Farseer Drek’Thar: If you choose to continue to help our clan, the other Shamanstones will sense your closeness to the Frostwolves and might bless you with more gifts. Return to the main hub for Frostfire Ridge (Horde Quests) in Warlords of Draenor, or continue below the Story Achievement: Siege of Bladespire Fortress.